Did you know that Italy has its own Sword in the Stone legend? And we also have the sword! That’s right! 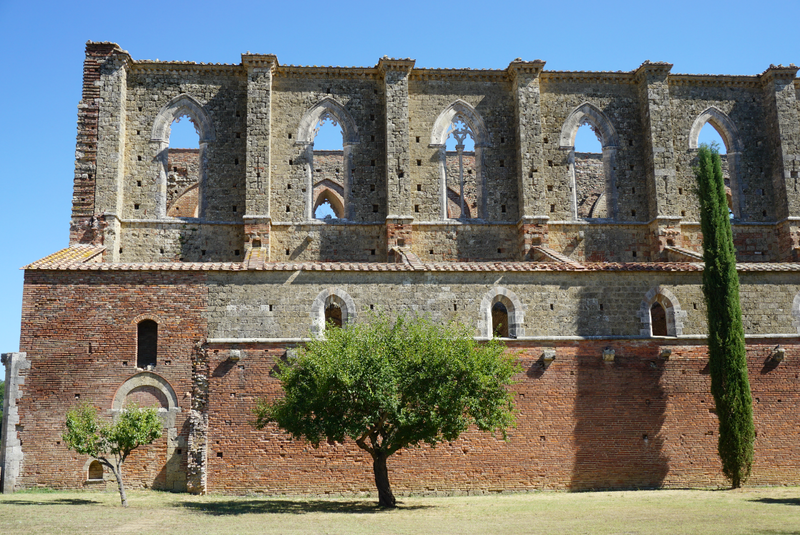 Forty minutes by car from Siena, among the orange, green and yellow land of the Tuscan countryside, stands a peculiar abbey, San Galgano. Probably many of you have heard of it or have seen some photos already. Its peculiarity is in fact the lack of a roof. By the way, if you’re looking for the translation of “The Sword in the Stone” in Italian you can find it in my Disney in Italian post! When I visited San Galgano Abbey for the first time (about 15 years ago) it was more suggestive, since, after a incredibly winding street, I finally arrived and I was completely alone. I enjoyed this place thoroughly. It was there only for my thoughts, my eyes and my heart. An incredible experience. I guess the place was not that famous at that time. Or I just got there on the right day at the right moment. Whereas the time I found they built a parking lot and there were some people around (still not a lot). Plus they set a fee to enter. Never mind. But let’s add some story here. Galgano was a medieval knight born in the lovely burg of Chiusdino (I really recommed a detour, it’s 20 minutes away by car). After a life of war, dissolution and lechery, he had a vision of God. 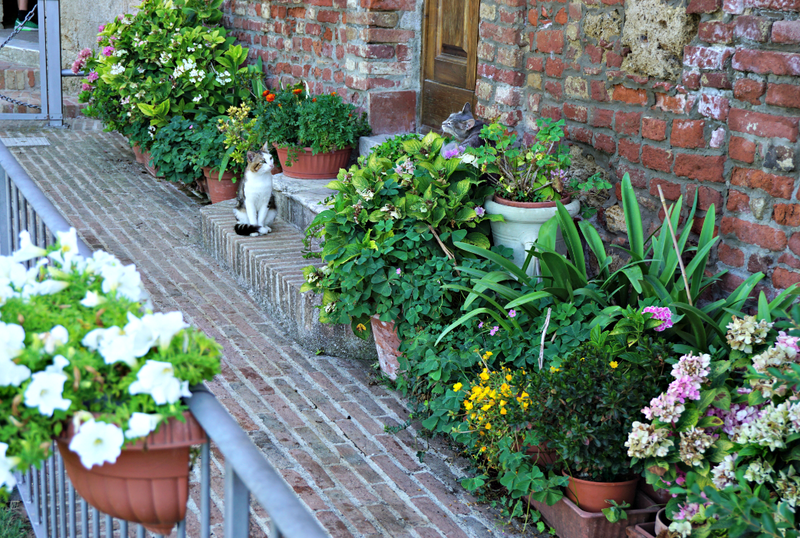 He then decided to lead a religious life and withdrew into a hermitage at Montesiepi. Since there was no cross there, he stuck his sword in a stone, as a symbol of peace. And there it still is since 1170. Some envious monks tried to extract the stone while Galgano was away. They could not. Moreover, it seems that God decided to punish them. One drowned soon after. Another one was struck by a lighting. And the third was about to die in a wolf’s maw. But he asked Galgano for mercy and he survived. In 2001 an examination was carried out on the sword. Apparently, it really dates back to XII century. But… it was not impossible to take. Just lodged in a gap of the stone. Only after some acts of vandalism it was cemented and covered with plexiglas. I do not insert the photo I took. Dark place + plexiglas cover = horrible photo. 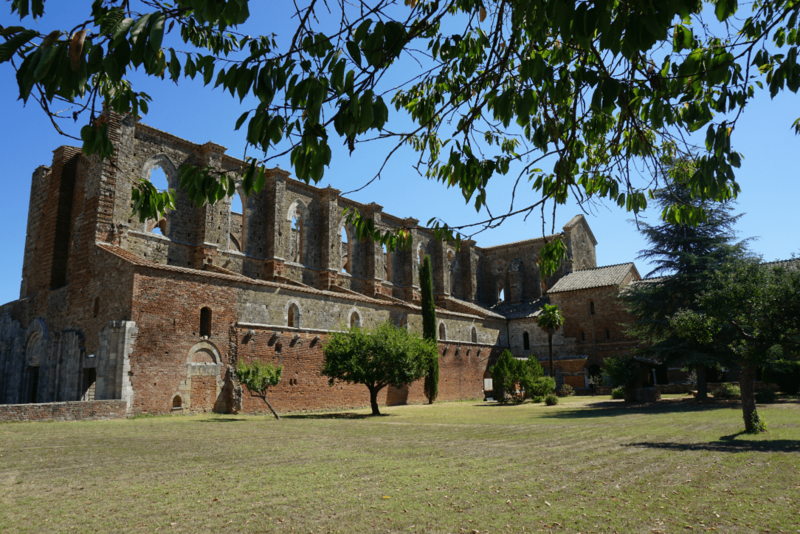 Upon arrival, you will at first spot the Abbey of San Galgano (1218), a huge building aimed to celebrate the cult of San Galgano. After a period of great splendour the decay began. The roof collapsed in 1768. It is quite nice to walk in there and it’s a beautiful spot to get picturesque photos. I also spotted some signs promoting evening concerts, which I’m sure must be very evocative. The sword in the stone is not here though. Near the abbey, half hidden by the trees of the adjacent hill, you will spot the circular roof (yes, this time there is a roof) of ther Montesiepi Hermitage. You can reach it by foot in 10 minutes. There you can find the sword. To walk around the abbey and the hermitage is very suggestive. 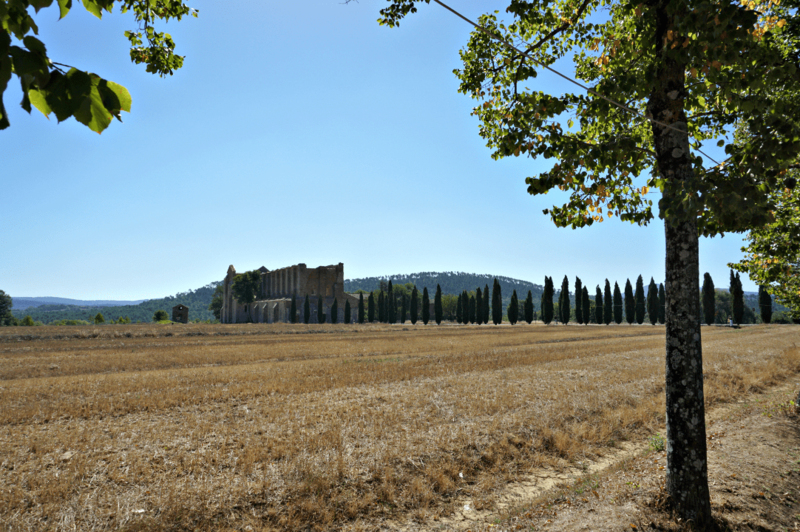 The view of the abbey, standing in a golden field under the Tuscan sun, is always breathtaking and I suggest the detour if you’re in the area. If you look at the panorama when you’re at the Hermitage, you will spot a village perched on a hill in front of you. That’s the burg of Chiusdino, where San Galgano was born. That’s a place you want to visit if you’re looking for a non touristy place. I also had a yummy lunch there at La Grotta di Tiburzi. Buonissimo!